In Florida, a divorce is also called dissolution of marriage. The divorce process is complicated at best, and therefore to be on the safe side, you had better hire the services of experienced Tampa divorce attorney. Apart from dealing with the emotional part of the divorce, there will be many other things to consider regarding finances and any children involved. An expert divorce attorney gives you a logical and emotional sounding board and a close confidant whom you can tell anything. He will also guide you in how to prepare amply for a divorce. Pay stubs, life insurance, investment accounts, credit card statements, purchase receipts of big items, stock certificates, business records, pension records, tax (income) returns, business tax returns and annuities … make a copy of each of these and keep them safe from your soon to be ex-spouse. It is best to make these records in advance because trying to get them when the divorce proceedings are already underway could be challenging and costly. If you think it is necessary, make a copy of it. You can even ask your attorney what you will need. No divorce judge wants to waste time listening to an argument about who will take what from the marriage. Therefore, include details in the marital settlement agreement regarding which spouse will get what stuff. All items should be listed clearly to clear all confusion. It is better that you and your spouse agree beforehand about which items each one gets to keep even before the divorce proceedings start. Simplified dissolution of marriage – This one is for a couple that does not have children and is not expecting any. No spouse should be seeking alimony from the other and the division of marital property as well as obligations must be agreed on beforehand. A property settlement agreement as well as a financial affidavit must be attached to the divorce petition. Regular divorce – One person, who will be referred to as the petitioner, files for divorce and he/she must have lived in Florida for at least six months. He/she must show that the marriage is broken beyond salvage before the divorce papers can be served to the other spouse – the respondent. Contested divorce – This is available for couples who cannot agree on the custody of the children or the division of marital property and obligations. They take their argument to court. Uncontested divorce – This is for couples who have agreed on the division of marital property and the divorce. They must attach a financial affidavit and divorce agreement to the petition and must testify at a hearing to finalize the divorce. Apart from the attorney and the court fees, there will be big financial implications from your divorce. You may even need to talk to a financial planner so that they can tell you just what will happen to your finances during and after the divorce. Your assets will be affected, and you may have to pay alimony to your ex-spouse. A contested divorce can be complicated. You may need to talk to a psychologist to prepare for the emotional turmoil of the divorce and a family attorney who will tell you what to expect out of the entire court process and the family law. If there are many joint financial obligations, you may want to talk to a financial expert for advice. Who pays for the mortgage and the car as the divorce proceedings continue? If you will get a new home, you need a budget for new furniture and other necessary items. You also need to know how much you will be paying for utilities. It is very important that you get everything down on paper. Divorce is never easy on the wallet. You will also pay your attorney and the court fees. 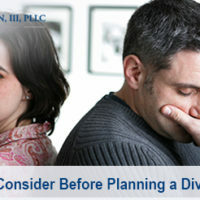 Even if you will still be working, project your budget into at least four months after the divorce is finalized. Even if you decide to go with the uncontested divorce type, you will still need a divorce attorney to advise you appropriately so that you do not come out short in the deal. Blair H. Chan III PLLC will have an experienced divorce attorney ready for you anytime, please call our Tampa office with any question or for a consultation.